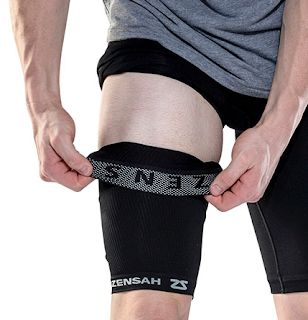 Disclaimer: I received a the Zensah Thigh Compression Sleeve to review as part of being a BibRave Pro. Learn more about becoming a BibRave Pro (ambassador), and check out BibRave.com to review, find, and write race reviews! 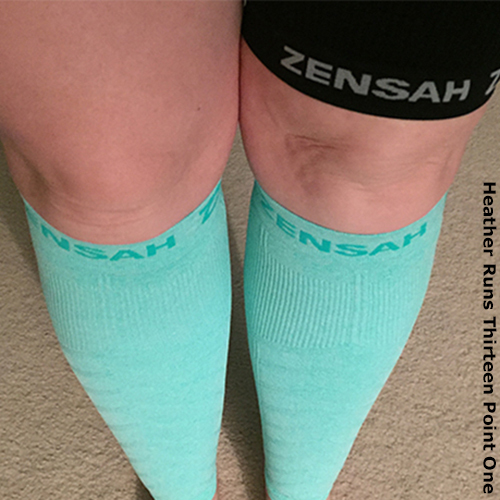 If you follow me at all on social media, I think you know how big a fan I am of Zensah compression leg sleeves. I honestly believe they are the reason I was able to complete training and cross the finish line to become a Dopey Challenge Finisher + the Castaway Cay 5k a few days later. I wore them for long training runs, and then the ultras for post-run recovery. My muscles always felt good the next day, as to before I used them I was usually pretty sore after long runs. Anyway, the point to this is that when I was presented with the opportunity to try the thigh sleeve, I jumped at it. Unlike the calf sleeves, the thigh sleeve doesn't come as a pair, but as a single sleeve. I think this sleeve would work great for you if you are experiencing any hamstring issues. I never wore the sleeve for running, but would put it on after my shower for recovery. 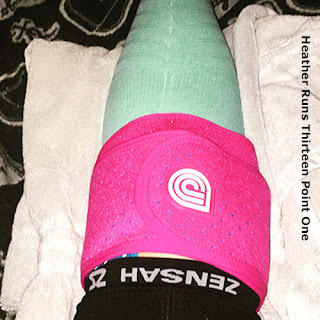 I was experiencing knee pain that might have been IT Band issues, and tossing the sleeve on post-long runs helped alleviate some of the pain. I was weary of wearing it for running, as I felt it would cause some serious chafing on my thighs... something I sometimes experience without the help of extra materials, if I'm being honest with you. 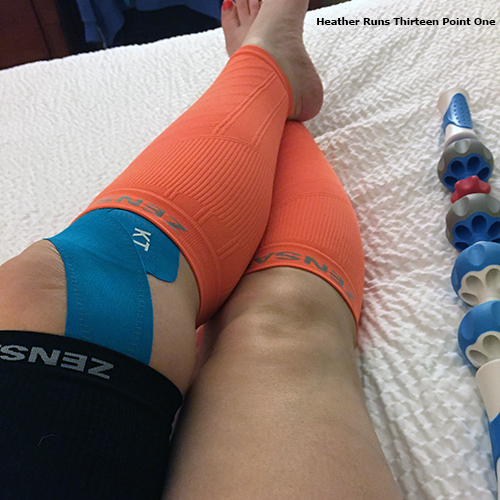 I also have a bit of a night before the race routine - which is to toss on my Zensah compression and roll out my muscles with my Addaday Pro roller. I tried this out for Foret2Base, which is when I was experiencing some of my knee problems, and though I still had some pain while running, it wasn't nearly as bad as it had been on previous runs. I got the L/XL size, which fit me well. I was initially concerned that it was on the large side, but after wearing a couple times and noticing the recovery, I knew I had chosen well (and accurately, really – I went by the sizing on the website). I found it easy to get on and off. I would suggest measuring, per their instructions, and use the sizing chart provided to select your size. If you have measured, use that as your guide. They provide a height for those that don't have a measurement for their thigh, so it's more of a general guideline. At the moment, it only comes in black and the size choices are S/M or L/XL for $24.99 a piece. 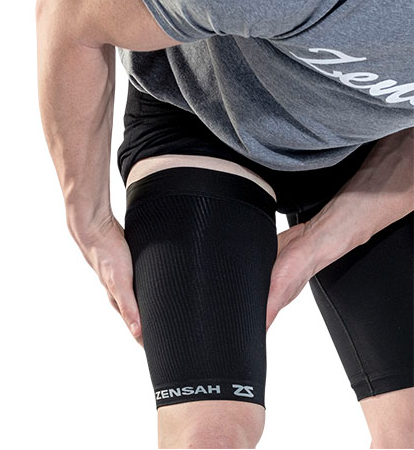 The compression technology helps to stabilize and support the quad and hamstring muscles, as well as improve circulation. It has a no-slip gripper (a bunch of grippy dots at the top), which is supposed to ensure that the thigh sleeve stays in place. I did, find, however, that it rolled down a little once on, but this didn't bother me at all. I found I still got the recovery magic needed for my thigh to feel refreshed the next day. • full range of motion: seamless design and compression technology provides a second-skin fit. • targeted quad and hamstring support: features pin-point compression to stabilize muscles in the quad and hamstring areas. Support is provided exactly where you need it most. 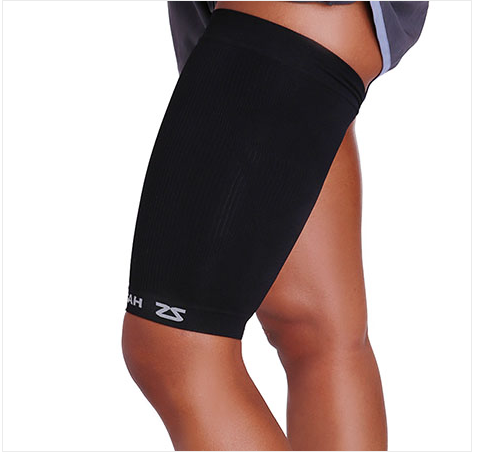 The compression technology also helps to reduce swelling and ensures the thigh sleeve keeps its shape. I would seriously check this out if you are a fan of compression, and definitely if you are experiencing any quad or hamstring problems. It might even help with your IT Band issues, like it did with mine. I'm no doctor, so I can't really get clinical about the effects of compression gear, but I am a believer. It works for me, and so I continue to use my sleeves all the time. I wake up feeling better the day after a long run, my legs feel less tired and sore, and this makes me happy. I ran 18 miles yesterday, and wore it post-run and today to help with blood flow and muscle recovery. Compared to how I used to feel before I wore compression, I'd say it's much better with it in my life. Want to know what the other Pros thought?